On 12 July, the Global Partnership to End Violence Against Children is launched at the United Nations in New York. 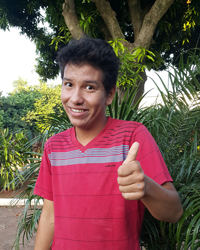 17-year-old Ramón, who grew up in an SOS Children's Village in Paraguay, has been invited to represent children and young people of his region. Ramón is a young man with many interests. 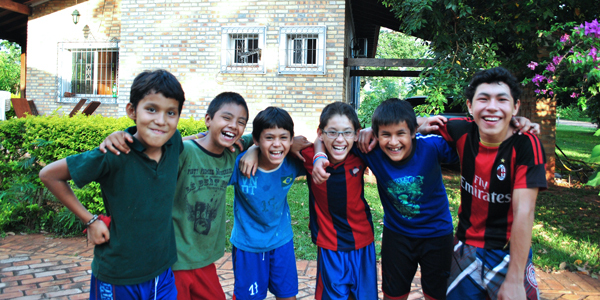 He is in his second year of the social sciences curriculum at the Hermann Gmeiner High School in Luque, Paraguay. He plays the tuba and studies music at the Municipal Music Conservatory. He is also studying theater and dance and is a member of the Departmental Council for Children and Adolescents of the Government of Central Department. In addition to his many activities, Ramón also shows a strong commitment to human rights. In recent years, he has spoken at a number of events and has represented the young people of Paraguay and the wider region in international seminars. Listenig to the voice of children and young people is essential when trying to find solutions to end violence against children, and Ramón gives them a voice - he is speaking out for them at the launch of the Global Partnership to End Violence Against Children at the United Nations in New York on 12 July 2016. In an interview, Ramón talks about the need to take action to end violence against children and his commitment to children's rights. You are going to take part in the Global Partnership launch in New York at the United Nations headquarters. How are you feeling about it? I'm very happy and proud because I'm going to be taking part in a very important meeting, and I'll be representing the children of Latin America. Being given this role is extremely important for me. I'm going to be able to speak to the Global Partnership on behalf of other children and young people in the region. What recommendations would you make to governments to guarantee a world where all children can grow up free of violence and exploitation? I would recommend that governments eliminate all types of violence against children. Awareness should be raised in society about problems of violence both in people's countries and elsewhere in the world. Governments should be encouraged to invest more to prevent and eradicate violence. They should also increase their budgets for education and provide information, because knowledge influences people and helps prevent violence. What do you think are the most frequent types of violence in Paraguay? The most frequent types are domestic, physical and psychological violence. How could violence against children and adolescents be prevented? To prevent violence, we should raise awareness and transmit knowledge. Information should be prepared that is less technical and gets through to people, using everyday vocabulary. A different culture towards violence needs be fostered from birth. Society should also be given materials about other ways of educating and working, to avoid structural, domestic and social violence. Based on the Global Partnership presentation and your experience of sharing with young people from around the world: How would you encourage people – especially young people and adolescents – to contribute to ending violence? First of all, I'm going to encourage young people to adopt a more analytical, critical mindset and find out about their rights, because if we don't know what they are, we're limiting ourselves. Let's look at ways of ending violence in society. I'll also contribute through what I enjoy, which is film and art; I plan to organize actions that help and influence young people. Violence against children is a serious and widespread problem affecting children and families. According to the Centers for Disease Control and Prevention, up to one billion children have experienced physical, sexual or psychological violence in the past year. The Global Partnership to End Violence Against Children brings together stakeholders from different sectors, including governments, the United Nations, civil society, the private sector, foundations, researchers and academics, and children and young people to join forces to end all forms of violence against children. Violence against children is not an inevitable part of life. It is preventable.